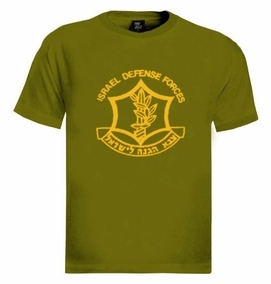 The IDF logo T-Shirt It is the authentic t-shirt that the IDF soldiers wear during training. This T-shirt is popular worldwide and is trendy, this design has existed for years and recently has been worn in the Hollywood movie "Tokyo Drift".Made from 100% Combed High-Quality Cotton. Our t-shirts are made of 100% cotton and are long lasting with bright colors. Our products are all designed and printed in Israel.